At the small gun range in Virginia where the Navy Yard shooter purchased the Remington 870 he would use in the attack, Miranda Green finds oblivious shoppers—and employees who quietly say Aaron Alexis was a member. A day after an armed man gained access to a secure naval facility in Washington, D.C., and opened fire, killing 12, the conversation has shifted to how he got a hold of a firearm in a city where gun control laws are at their strictest and conceal and open carry is illegal. Authorities traced the origin of the Remington 870 shotgun that shooter Aaron Alexisused in the Navy Yard massacre to a small gun store in Virginia that sells a wide variety of firearms and is connected to a gun range. 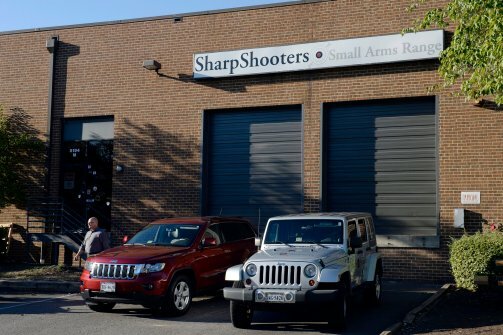 Less than 25 minutes from the Navy Yard, Sharpshooters Small Arms Range is the definition of nondescript. It’s off a freeway entrance, across the street from a self-storage facility, and down a semi-paved road with no signs directing the way, and a person wouldn’t know he’d found the store until he was right in front of it. The less than 800 square feet of retail space inside make Sharpshooters feel like a mom-and-pop store. Only its wall rifle display and rows of gun paraphernalia give it away. Employees say frequent visitors to the attached shooting range, which accommodates up to 13 people, vary from “soccer moms to your everyday schmo,” including many service members from Fort Belvoir, five miles away. It is here that Alexis reportedly purchased the shotgun he used Monday. It isreported that Alexis first tried to buy an AR-15 assault rifle at the store but was stopped due to state law that prohibits the sale of such firearms to someone with out of state residency. He also used a 9 mm pistol he apparently took from a police officer at the scene. Although management at Sharpshooters on Tuesday was reluctant to acknowledge Alexis as a customer, issuing a statement saying only that the store is a lawful gun retailer in Virginia, an employee independently confirmed to The Daily Beast that Alexis was indeed a member. Membership is required at the shop for everyone who rents weapons in the gun range, and members must prove they have experience wielding a firearm and pay a $25 monthly fee for use of the range. Several customers visiting Sharpshooters on Tuesday said they had no idea the shop had any connection to the mass shooting the day before but said they didn’t see a connection between gun control and the attack. Another man who said he was a merchant for Sharpshooters and had been visiting the store for more than 26 years faulted the government’s security clearance system. Alexis was arrested twice for unlawful use of a firearm. In 2004 he was arrested in Seattle for shooting out two tires after becoming frustrated with construction workers parked close to his home. He told authorities he had done so in a blacked-out fit of rage he blamed on the PTSD he said he suffered after helping first responders on 9/11. In 2010 he was arrested in Fort Worth, Texas, where he was stationed in the U.S. Naval Reserve, after discharging a firearm through the ceiling into the apartment of his upstairs neighbor. According to Virginia state law, a person must present a form of identification and an alternate form of corroborating documentation to purchase a rifle or shotgun. He or she must also pass a criminal background check, although the state does not require registration. Red flags for the background check include felony indictments, active misdemeanor charges, felony arrest warrants, or convictions for any felony offenses, none of which Alexis had despite his previous arrests.